Apple removed the ability to burn disc images from Disk Utility from MacOS High Sierra, Sierra, OS X 10.11 El Capitan, and newer, and while that makes sense for many Macs that no longer have SuperDrives, CDRW, and DVD burners, for those who use an external burner, use disc drive sharing, or who do have hardware with a built-in SuperDrive, may find it frustrating to lose such a feature. But not to worry, you can still burn disk images and data discs in modern MacOS and Mac OS X releases, and you can start the process either from the Finder or from the command line on the Mac. Note this is not necessary in older versions of Mac OS X, which allowed burning ISO files from Disk Utility. This is exclusively for macOS High Sierra, Sierra, OS X El Capitan and later, where the feature no longer exists. Again this is relevant to modern macOS versions, like High Sierra 10.13, Sierra 10.12, El Capitan 10.11, and later, earlier versions can burn an ISO right in Disk Utility. Know of another method to burn an ISO on a Mac? Share with us in the comments below! Kind of surprised people still use DVD burners but also kind of frustrated that Apple doesn’t use them at all anymore. I still use recordable optical media for small, semi-permanent backups that are stored offsite. Sometimes this is a specific project that doesn’t merit an archival USB thumb drive and isn’t large enough for a hard drive or the risk and delay of putting it up into the cloud. In addition, I frequently use optical to dupe audio media for various uses (no, I’m not pirating, etc.) And I still rip CDs from my own collection, which numbers in the thousands and is therefore an ongoing project. I also will rip audio CDs that friends own to various formats for them, using apps other than iTunes where we can be really specific about the format, bit rates, etc. (Hello, XLD!) I don’t always want to go through the trouble to rip something I already paid for to listen to it from the hard drive on my MBP, so again a CD drive is still invaluable for direct CD audio playback. Not everybody has succumbed to the “stream-everything-all-the-time” mentality. For one thing, many times the versions of DVD movies and CDs are different or better in their (original) optical media forms. I’d like to keep my choices open, especially when the new-format media only offer inferior formats or versions of a given title. And the current streaming rage assumes one has 24/7/365 net access at decent speeds. This is absolutely not the case unless one is holed up in a very specific place—and probably in a large metropolitan area—to boot. Hope I made the case. That’s a good case. Just beware that your optical media has a finite shelf life – directly dependent on the environment its kept in. Albeit these span decades, it would be a shame to lose a DVD full of data needed for something important or a keep sake down the road. DVD or CDs are a really cheap semi-permanent way to give files away. No uploading or downloading for clients. they don’t have to bring a USB drive that would likely be too small anyway or an external hard drive. How do you know Apple doesn’t use them anymore? I have been buying only Apple products since before 2000. Over the years their business model continues to try and squeeze every last cent from their consumers. For example the cost of the external burner is outrageous. Third party external burner drives have mysterious compatibility issues with El Capitan. I’ve always thought the way Macs handle discs has been crap. It might be as you said about third party burners and the OS though, for instance if I leave a disc idle in the drive for too long, (an hour maybe), the disc is still visible on the desktop but becomes unusable forcing a power FULL down and power up – not a reboot. Anyway, there is a post on MacRumors that has a way to get the old Disk Utility working on 10.11 and this is what I have done. 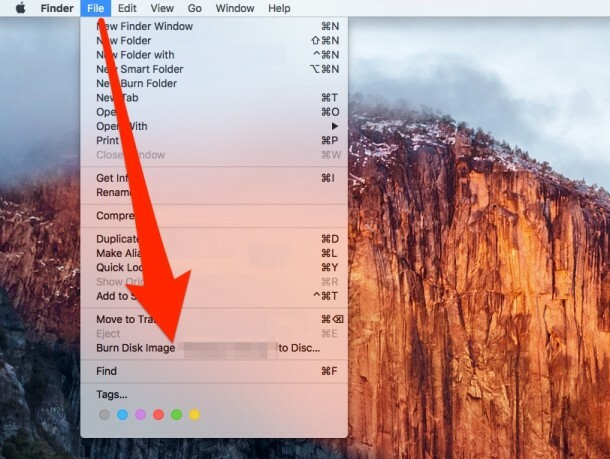 Re: Your article:Burn a Disk Image File (ISO, DMG, etc) from the Finder of OS X.
I assume that is the same as your computer showing “Burn Disc image to Disk”? This doesn’t work at all! First off, if you’re going to all of the trouble to screw up the burn Iso to disc feature, why not just right click and select burn iso to disc? Second when you do select burn iso to disc, either from the file menu or the right click option, it actually just burns the iso file to the disc. In other words, worthless. The point of burning an iso, or image file, is to make a disc with that image ON the disc, not just that file OF the image ON the disc. IDIOT! I just wasted a CD-R to disprove you. Actually it burns the ISO to the disc as the disk image. Sorry to hear this is above your technical skill level, I would recommend you stick with the iPad which doesn’t have a complex CD burner or ISO files to work with. Just touch stuff on the screen you want to do! That’s better suited to someone like yourself. Not everyone has to be tech savvy! Gotta Love it when Mac fanboys insult people as a digital means of peen measurement. Trust me, there no correlation between Mac knowledge and peen size. Yep…it’s an old post, and comments on the internet never go away. Easy peasy. Put in a disc and that’s it. I burned a windows 7 dvd iso and it doesent load. I tried 2 different isos and non of them bootable. I burned the same iso from windows/nero, then it works, automaticly recognizes it. With Finder burn tool, after restart, holding alt – only shows the hdd and cant see the disk. Actually, all you have to do is right click the file or folder you want to burn to a CD, and select burn to disk. You don’t see the point of the discussion do you? Writing an image to a disk is not the same as writing a folder or file to the disz. This makes the assumption you have already created the disc image to burn. If you insert a DVD of home movies and you want to duplicate it, you still have ti make the disc image first. So, if you have to do that, you might as well do it from the Disk Utility. It does not work. I had to burn the image through toast to make it bootable. After I burned the ISO file on the DVD I could not play the disc on my TV DVD player. The “burn disk image to disk” process only copies the ISO file. Now, if I double click that ISO file from my computer it does start playing the DVD but not on a regular DVD player….. any ideas of why? I’ve tried it however it still will not play in my car or stereo? It is simple and intuitive but not work for me. Then I went to Total Video Converter, that worked! Love the information provided. It works for me. !